“My partner and I bought an Aussie Wheel unit last year. I thank you for the honest discussion about its capabilities and your prompt service. We have to use it where the caravan is on a slope and, on your advice, we used very solid chocks in case the mover didn’t hold. However, although the chocks are still there ‘in case of emergency’ I realise that some would not use them at all. The mover has made a potentially dangerous and damaging task, safe and achievable, without the help of 4 burly neighbours. Welcome to AussieWheel, the best caravan mover, boat mover and trailer mover manufacturer offering quality and high performance to the Australian market. 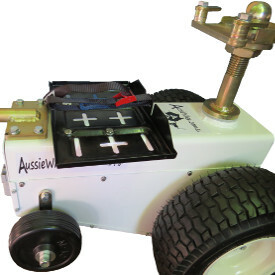 Aussie Wheel Electric Caravan & Boat movers are manufactured for Australian conditions and trust us that our power mover range is the best in terms of design, price, performance and quality. Our movers will help you get the job done safely, quickly and effectively. Hopefully you will be comfortable recommending us to your friends. We guarantee you will not find a better, cheaper product in the market. 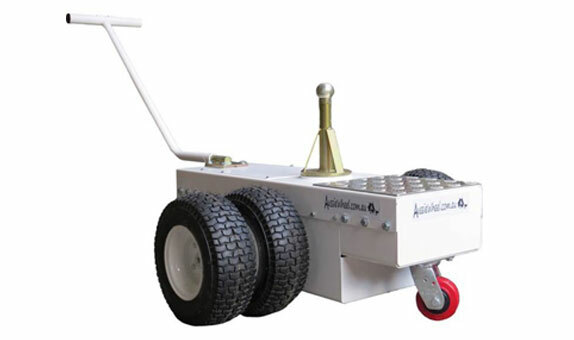 Caravan Mover with optional chevron tyres and jockey post. 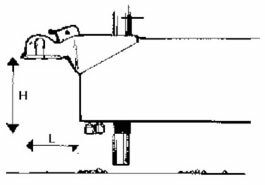 Trailer mover shown with Standard Balloon tyres and Jockey Post Hitch. Battery Tray, Balloon Tyres and Ball Hitch. 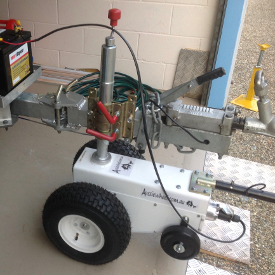 AussieWheel with Standard Balloon Tyres and Jockey Post Hitch. 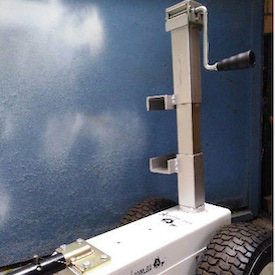 The AW1 to AW4 models are aimed at the domestic market, however for the larger vans and factories/small caravan yards/boat yards we offer the AW5. 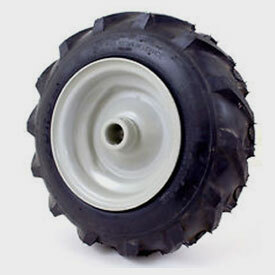 Note: Balloon or Chevron Tyres can be foam filled. 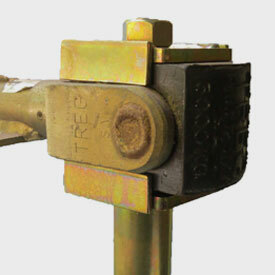 Double clamp gives stable connection. 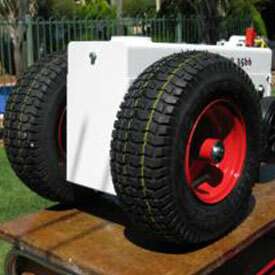 Fits up to 150mm A-frame chassis. 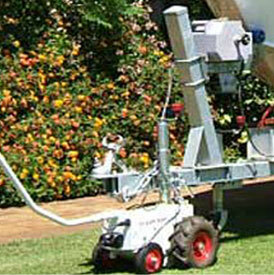 The motor and worm-drive gearbox provide the most power output for size and is rated for continuous use. 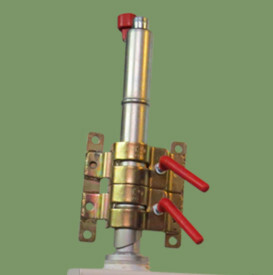 A forward and reversing rocker switch in the handle stops motor instantly and acts as a brake when released. 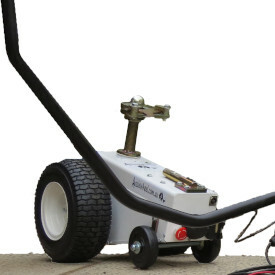 The handle is removable for transport and can be angled each side so that machine can be operated whilst viewing along the side of caravan or boat. Power is from any 12V DC battery usually mounted in van or a battery tray can be fitted on the top of unit. A battery lead is supplied with your choice of connecting clips. (Crocodile clips, Anderson plug or ring connectors.) Standard is 3.0m long. It is preferable to keep this as short as possible to prevent possible voltage drop. The AussieWheel is also available with 24V DC increasing speed 40%. When more power is required – going over grass, going up a slight slope or a lot of turning always select the more powerful unit. Driving wheels can be either single wheel drive for easier turning or both wheels driving for maximum pulling power and grip. With heavy loads tyres can compress on one side when turning, this can be overcome for Balloon or Chevron tyres with foam filled tyres. This option must be chosen at time of ordering. Unlike most movers, AussieWheel does not have a chain drive but relies on a direct shaft drive from the worm-drive gearbox. 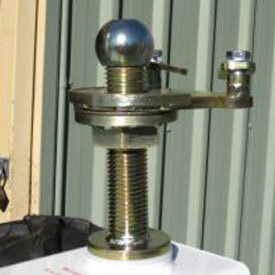 Where possible we use Australian parts and local suppliers. A two-year warranty is standard for Domestic use and 12 months for Commercial use. Fully C.E. Electromagnetic tested and approved in accordance with AS1044. © Copyright 2019 Aussie Wheel. All rights reserved.